Do you have an email signature? It is usually used when sending business emails and it is nowadays a sign of professionalism and liability. That aside, an email signature is a type of marketing technique that creates a certain brand. Let’s take a closer look at why we really need these signatures, and how their design could make them look perfect. Read on. Why are Email Signatures Important? You are a professional company or individual that cares about your clients and pays attention to every detail. You are always ready to communicate with your clients and they can get back at you anytime. You are assuming the role of a marketer and you are building a brand out of you or your company. The third one is probably the most important of the three. When you receive an email from customer support of a big company, you can always see that their email signature contains their logo. Without even reading the content of the mail, you will immediately know who sent it, and that makes all the difference. If you don’t have an email signature, at this point you are probably wondering how to make one. Well, it’s a pretty simple process, and you can do that for free. What Are Popular Designs in Email Signatures? 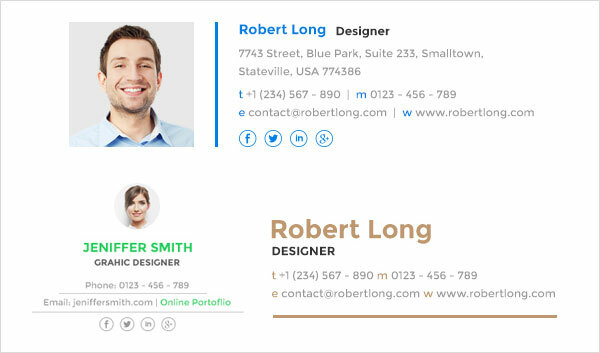 Since the design of email signatures is a relatively new area that is still being explored, there are a couple of rules that you should follow in order to get the most out of your signature. First of all, try not to include too much information and keep the text as short as possible. For example, some designers even advise using a quote as a nice little touch to the signature, but not all of them agree on that. However, what all of them do agree on is that your email signature is not your CV and the info in it should be as short as possible. The font of the text should also be rather plain and not too edgy. Try using some of the fonts that most email signatures use, and try to keep the same font throughout the text. Furthermore, you have probably noticed that the info in these signatures is usually written with a tiny font, and for good reason. Email signatures are meant to be an addition to an email, and should by no means distract the recipient from the content of the email body. This principle also applies to a color used in a signature. Your email signature should contain only one or two colors and, if possible, they should somehow be related to your logo or the primary color of your brand. Some experts even claim that the signature should not contain colors at all, and that the text should be in plain black and white, with the only color that comes from your logo or photo. After you have written a professional email, it’s time you added a great email signature as a nice little touch that will let the recipient know that you are always at their disposal. There’s a line you should draw regarding the amount of information that you want to insert into your signature. First of all, you should insert your full name, your title, and the name of your company. These three are the most important details of a signature that better inform the recipient about who you are and what you do. Next, you should add the contact options. The recipient probably knows that they can contact you via email, but it is always a good idea to let them have other options as well. For example, always try to leave your phone number and your Skype name. Some opt to go one step further and add the postal address of their company’s headquarters, which may prove useful if you are doing business with clients in the area. The last stage is adding your social media profile icons that will lead to your Twitter, Facebook or LinkedIn account, and more. Another important element that your signature should contain is the link to your website (if you have one). This is not necessary but is strongly recommended, as most of the people would like to visit your site when they receive the first email from you. Creating an email signature is not rocket science. Email signatures are not reserved only for big companies anymore, and now everyone can have them. Services, such as WiseStamp, make things a lot easier as they provide free popular templates that you can set up in minutes. Thanks Zee, great overview of email signatures. A beautiful email signature will definitely make you stand out. I would only add that you do have to make sure the body of your email is formatted neatly as well — just to make sure you come off as a professional.